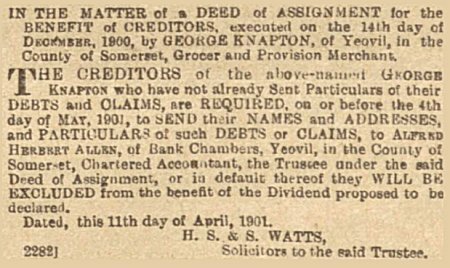 George Knapton was born at Chedzoy Lane, Bridgwater, on 6 May 1848. He was the elder of the two sons of bricklayer and mason Emanuel Knapton (1819-1851) and Charlotte née Hamblin (1819-1902). He was baptised at Bridgwater on 17 June 1849. The 1851 census recorded the family at 10 Chedzoy Lane; Emanuel, Charlotte, George and his brother Walter (1851-1866). On 23 April 1879, at St Aidan, Kirkdale, Liverpool, Lancashire, George married Amy Tooms (1857-1908), originally from Boston, Lincolnshire. They were to have eight children; George Alban Walter (1880-1934), Harold (b1882), Edward Wilfred (1883-1884), Bernard (1885-1895), Leonard Stephen (1887-1915), Winifred May (1889-1966), William Selwyn (1891-1893) and Cecil Dunstan (1893-1971). In the 1881 census, George and Amy, together with George Jnr and a servant, were listed at 127 Stanley Road, Kirkdale (which had been Amy's address at the time of their marriage). 30-year old George gave his occupation as a draper. By 1887 (when their son Leonard was born) the family had moved to Yeovil. George set himself up as a grocer at 86 Middle Street and was listed as such in the 1891 census. Living with them above the shop were their children George, Harold, Bernard, Leonard and Winifred, as well as a domestic servant, a nurse and a grocer's shopman. The customers, were suited to their mind." Happy customers! Happy John Gilpin, of whom the line was written, to so please his patrons. 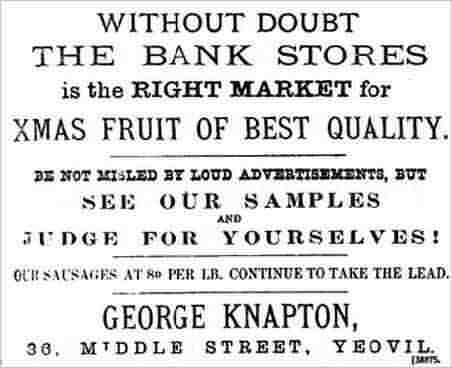 But if our Yeovil readers will accompany us in a look round Mr Knapton's shop, which he has filled with all kinds of goods to tempt their appetites, we think that they also will say that they can be "suited to their mind." As it is but reasonable to look at both sides of a question, let us see the exterior and interior of the house. The premises at 86, Middle Street, have a good frontage, the plate glass windows encasing a most attractive show of various sorts of comestibles. Attention is paid to the display, so that it is always clean and bright and of a nature to tempt the casual customer. Nor does the interior belie the outwardly promising appearance. There is ample room for keeping both a large displayed and reserve stock, and the space is fully utilised - the selection, manipulation, and price of the goods bespeaking most able management on Mr Knapton's part. The business is conducted on the co-operative store system for cash. There is no doubt that in what large manufacturing centres are pleased to call 'towns' country the character and quality of the food, especially eggs, butter, cheese and bacon, &c, is of a vastly superior nature, and the stock we saw at 86, Middle Street, amply demonstrated this. One of the special features is tea; what with the reduction of the duty, and the competitive spirit abroad that gives us a multifarious choice of good blends and growths, the tea drinker has fallen upon happy times; and through Mr Knapton's agency, he can obtain all the benefits, legislation, commerce and nature have showered upon him. The teas sold here are new season's growth from India, China and Ceylon, and may well lay claim to their title of unrivalled. Coffee, sugar, spices, preserves, tinned meats, and all laundry requisites are stocked, and in all, perfect freshness is assured. A large number of proprietary articles are kept, and a good trade is done in patent medicines at prices that compare favourably with those of any other store. The business is smart and well conducted. In 1895 George was noted as a Grocer & Provision Dealer of 86 Middle Street in the 1895 edition of 'Where to Buy' and was similarly listed in the 1896 edition of Whitby's Yeovil Almanack Advertiser. However, life was clearly not going too well for George and he found himself in serious financial difficulty. 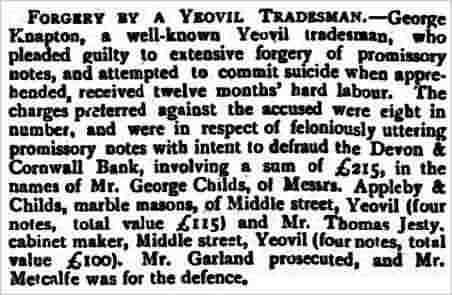 In January 1901 George, described as "formerly a Yeovil grocer", found himself in court. It transpired that George had forged signatures on eight promissory notes amounting to £215 (around £23,000 at today's value). This included four notes to a total value of £115 in the name of George Childs of marble masons Appleby & Childs of Middle Street, and a further four notes with a total value of £100 in the name of cabinet maker Thomas Jesty, also of Middle Street. George was arrested and tried to commit suicide. George Knapton was committed for trial at the Winter Assize at Taunton for the embezzling charges and the attempted suicide. He confessed, was found guilty and sentenced to twelve months hard labour. In the 1901 census, taken on the night of 31 March 1901, George was recorded as a prisoner languishing in HM Prison, Shepton Mallet. He was also declared bankrupt. Also, by the time of the census, Amy had removed herself and the children to 75 Dorchester Road, Weymouth, Dorset, presumably to escape the notoriety of her husband's fall. George also moved to Weymouth on his release from prison. Amy died in Princess Christian Hospital, Melcombe Regis, Weymouth, on 28 February 1908, aged 50. In the 1911 census 62-year old George was recorded as a boarder at 1 Avenue Road, Weymouth. He gave his occupation as a grocer. On 24 December 1911, at St John's church, Weymouth, George married May Cole (b1867), 19 years his junior. George Knapton died in Weymouth in December 1925 and was buried on 9 December 1925 at Melcombe Regis. He was 76 years old. 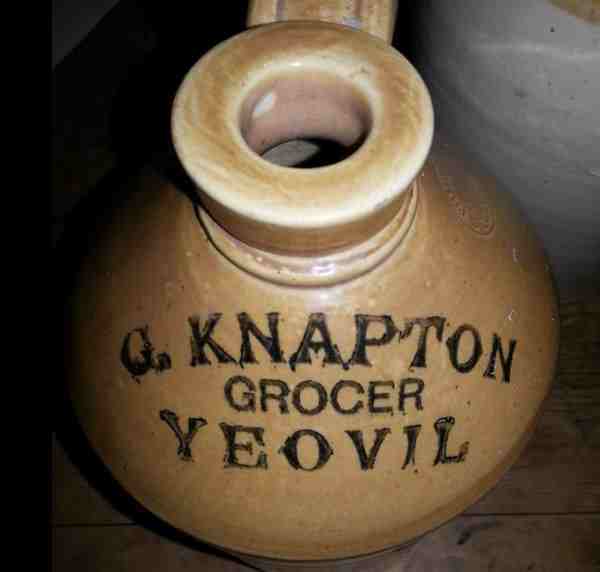 A stoneware jug of George Knapton's, dating to the 1890s. George Knapton's advertisement in the 8 December 1893 edition of the Western Chronicle. 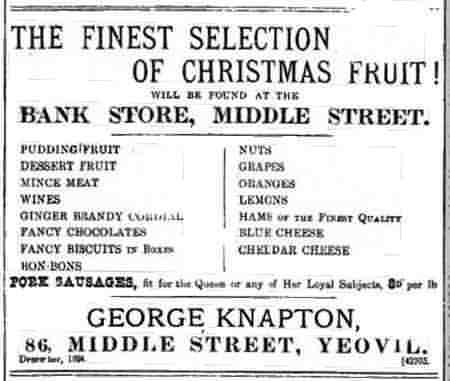 George Knapton's advertisement in the 21 December 1894 edition of the Western Chronicle. A notice placed in the 17 August 1900 edition of the Western Chronicle by George, announcing his intention to apply for a wine and spirits license. 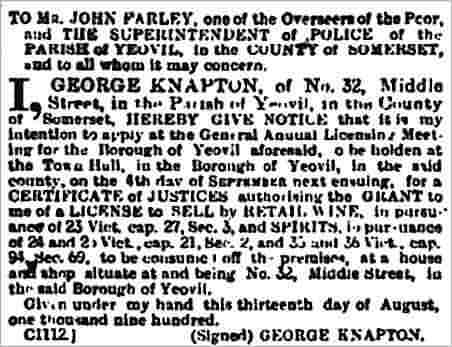 The notice of George's arrest and attempted suicide from the 11 January 1901 edition of the Western Gazette. A brief synopsis of George's trial and sentence from the Chard & Ilminster News' edition of 2 February 1901. From the 31 January 1901 edition of the Bath Chronicle and Weekly Gazette. George was declared bankrupt in 1901. This notice is from the 12 April 1901 edition of the Western Gazette.